It is a blessing to any nation when its leader not only reads the Scriptures, but quotes them publicly - as the Queen did yesterday in her Christmas Day broadcast, when she said ' “It is true that the world had to confront moments of darkness this year, but the Gospel of John contains a verse of great hope, often read at Christmas carol services, ‘The light shines in the darkness, and the darkness has not overcome it.'" We had a record turnout for Carols by Candlelight last night at St James, with every seat taken downstairs and lots of people in the galleries. 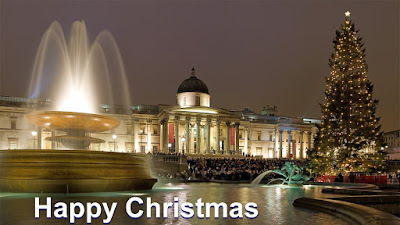 In my address I said: 'God has come to this world in person. He loved the world that much. He cared for you that much. He became a human being. He was born as the baby Jesus who grew up to be the Saviour of the world. He came to show us the way. He came to bring us back to God. He came to live amongst us in our beautiful but broken world. The Word became a human being and, full of grace and truth, lived among us. We saw his glory, the glory which he received as the Father's only Son John 1.14. And here’s the very best news of all. 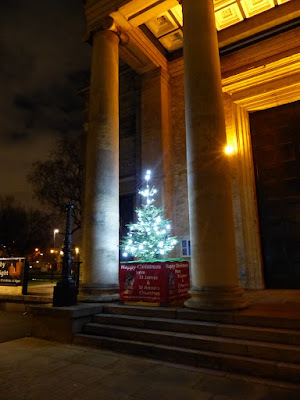 Jesus is not just for Christmas. He can be your friend, your Lord, your Saviour, your hope, and your joy every day of the year - if you put your trust in him.'. 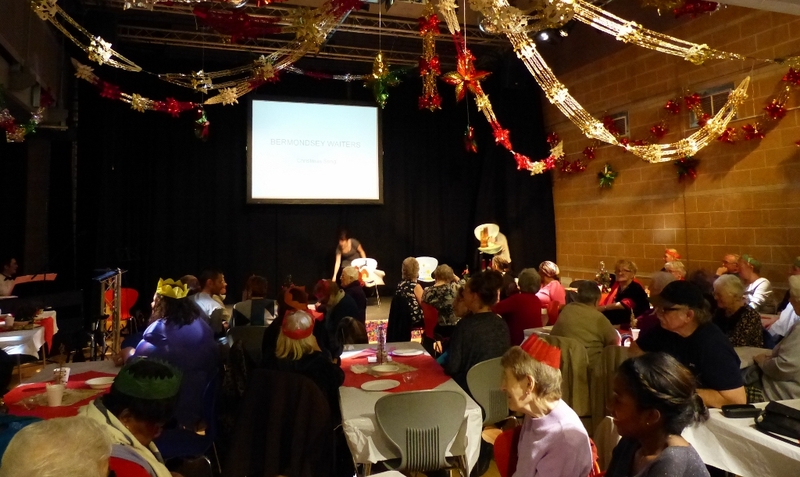 It seemed like the best attendance ever at the Age Concern Healthy Living Centre's annual Christmas Dinner. Once again a wonderful Christmas lunch had been prepared by the centre staff, aided by volunteers (from the local community and local businesses), and donations from local charities such as St Olave's. 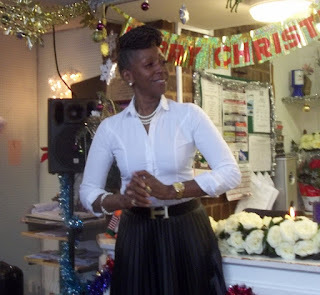 The one sad note was that this was the very last Christmas Lunch to be presided over by Simone, the manager of the centre, whose hard work, vision, and sparkling personality have made it the very great place it is. 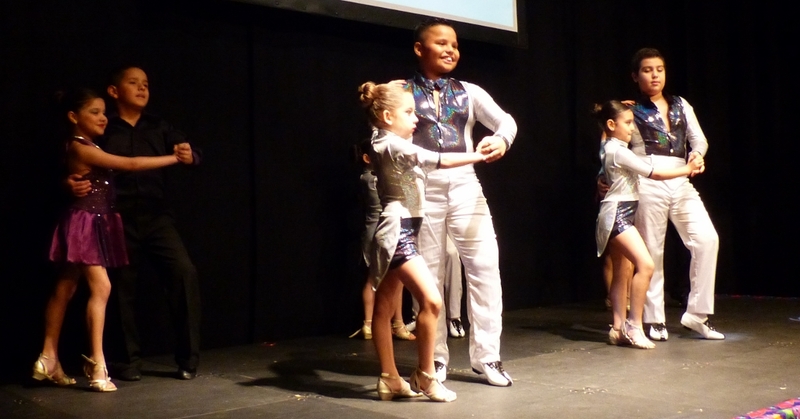 Thank you, Simone, for all you have done for the local community. 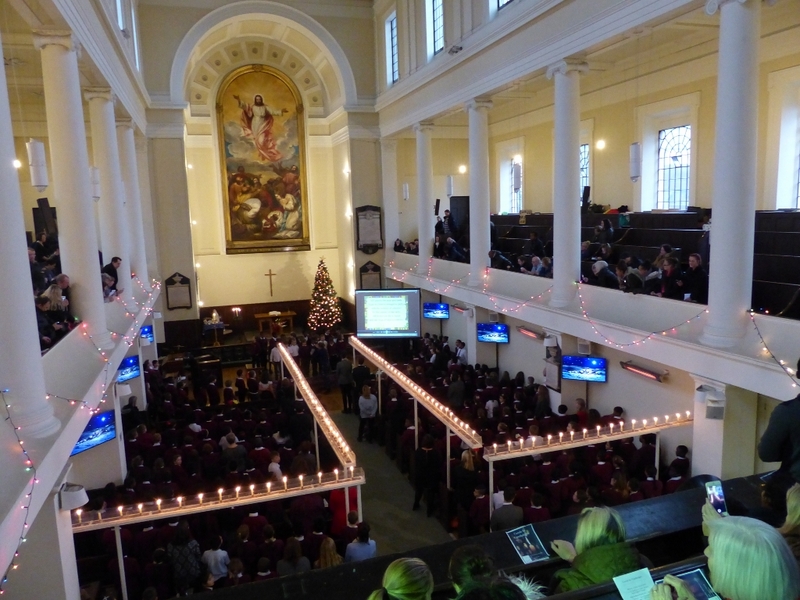 Christmas is nearly here and the it is the very last day of term, and so there was a real buzz of excitement as the whole of St James's school - KS1 downstairs, KS2 in the galleries - came to church this morning for the end of term Christmas service. 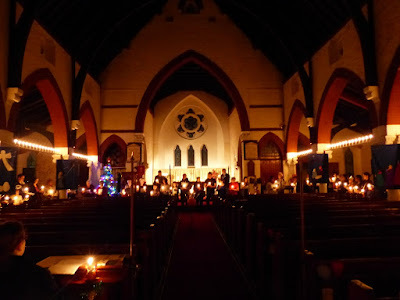 the Bible, Penny spoke about the angels bringing the message of God's love for the world, and we sang one more time some favourites: It was on a starry night; Come and join the celebration; Away in a manger and Hark the Herald. 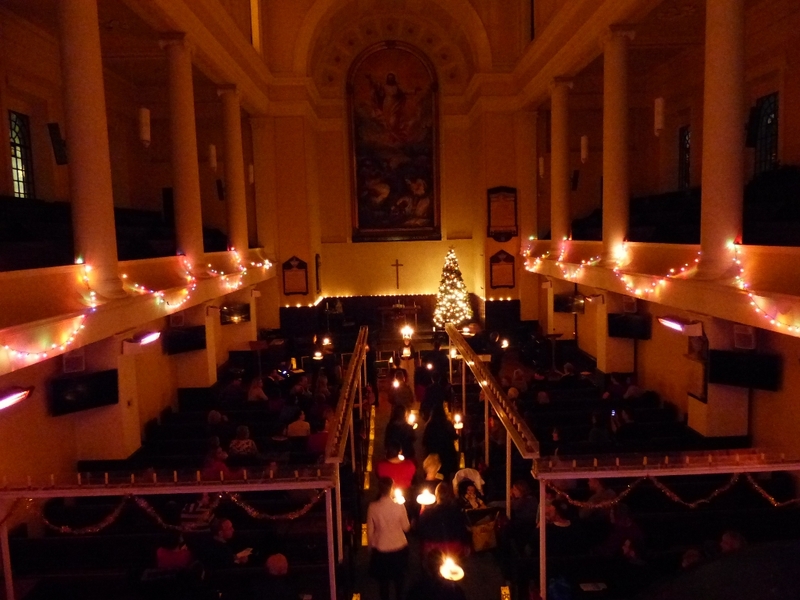 After the service we visited all the classes on both school sites with invitations (right) for the children's Christingle Service in the church on Christmas Eve at 5pm, a short (30 min) service with children particularly in mind, but loved by all ages. 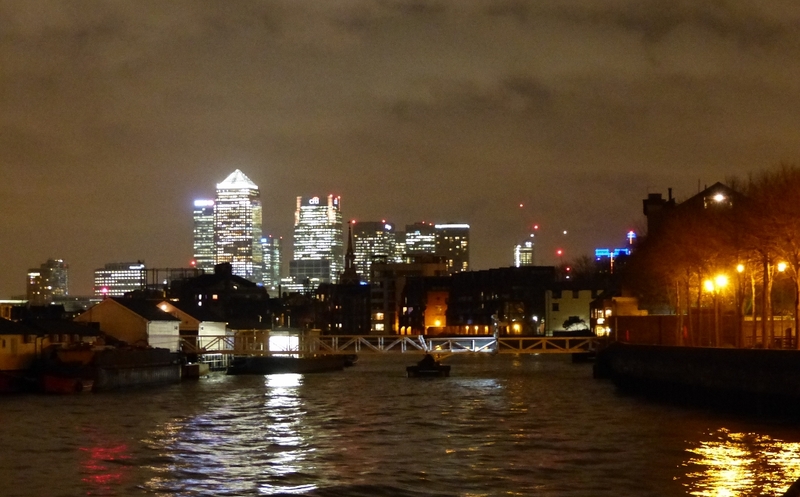 It's been a good term. Everyone has worked very hard and now .... a well-deserved rest for everyone. So Happy Christmas everyone at St James's School. We had our open air carols in the churchyard tonight, followed by mulled wine and mince pies. 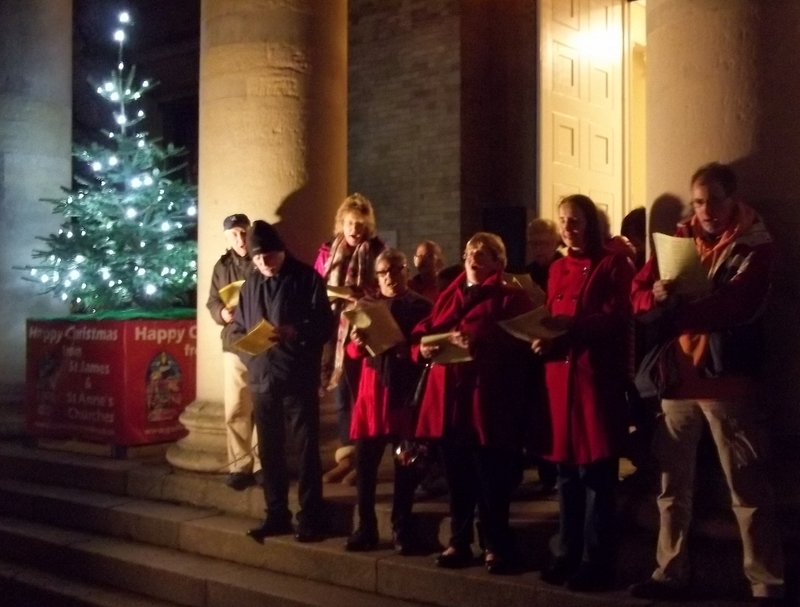 Pictured some of our singers (left) at the front of the church portico. 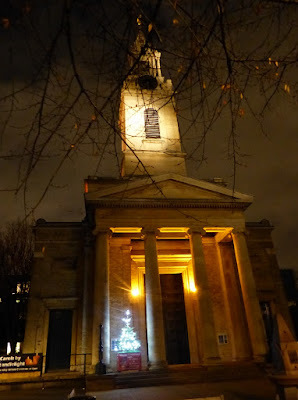 The mild weather meant that some people sat in the churchyard to listen t and lots of others stopped to capture the scene on their phones. And now everyone gets the opportunity to sing inside the church with Carols by Candlelight coming up on Sunday at 6pm. 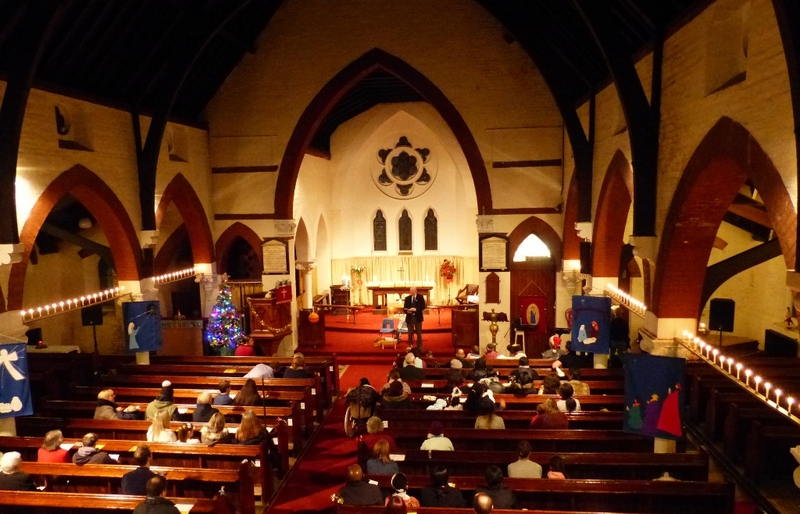 It was, I think, their best carol concert ever. Key Stage 2 ('the Juniors') of St James's School flocked to the church this afternoon for a memorable concert of carols, bible readings, and prayers. 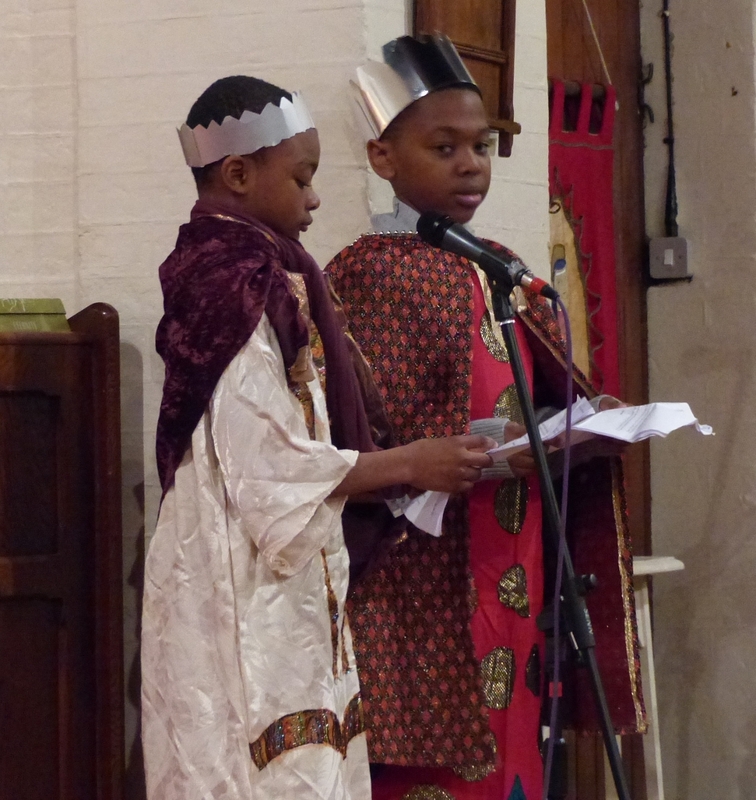 Every class took part and took their turn on the stage at the front of the church. There were carols for the whole congregation to sing, too, and an amazing deeply moving rendition by the whole school of 'O, Holy Night' . 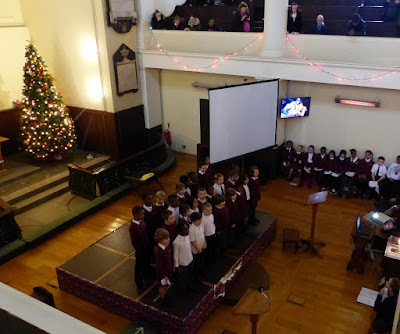 And the school gospel choir were the stars of the show with their all singing, all dancing, upbeat version of 'Joy to the World' which was received with thunderous applause by the whole school community, children, parents, teachers, & governors. Thank you to everyone for a really excellent afternoon. Travellers arriving home tonight at Bermondsey tube station were serenaded by carol singers from St James and St Anne's. 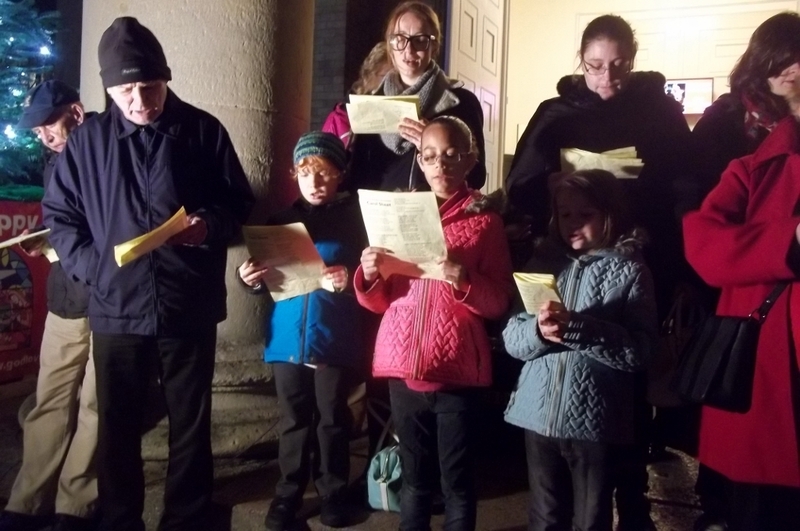 We gave out about a thousand leaflets and received lots of positive feedback from commuters, some of whom filmed the scene on their phones, as we spread a little Christmas cheer in the locality. Next up: outside St James's on Wednesday at 6.30pm. Thanks to Mr Myles for these great pics of St James School KS1 nativity, the day the church was truly overrun with angels, shepherds - and quite a few camels and stars, too. (Left) Three angels from the Sunday School Nativity Tableau holding their lighted Christingles tonight at St Anne's Christingle & Carol Service. 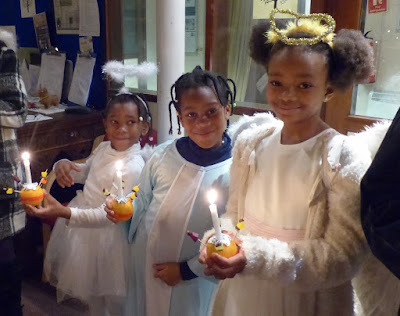 The Christingle is a Moravian custom that brings home the true meaning of Christmas and has become very popular in this country. The orange represents the world. The cocktail sticks and the sweets represent the seasons of the world and the fruits of the earth. 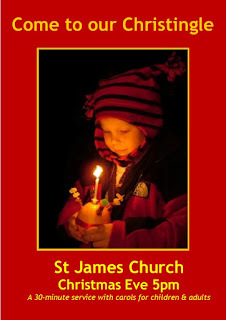 The candle represents Christ the Light of the World, and the red ribbon, represents his blood shed for our salvation. The Christingle Service is a great way to remember at this time of the year that God loved the world so much that he gave his only Son. 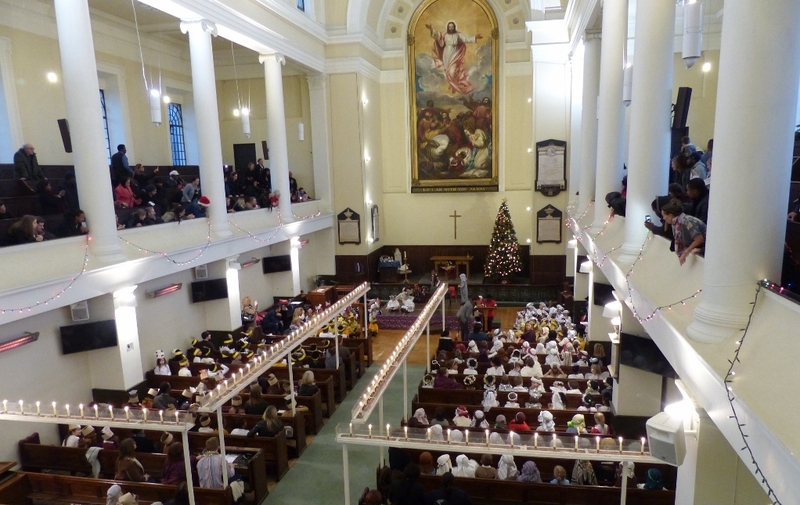 Christmas for St James's School got off to a great start with the Key Stage 1 Nativity Play in the church (left) yesterday afternoon. They were watched by hundreds of parents and family members, with the children all in costume and enthusiastically joining in all the songs. As ever, a big thank you to all the staff members who made the whole event possible. New this year at St James: a Christmas tree outside the church as well as inside (thanks Paul, Stan & Lawrence), spreading a bit of Christmas cheer to passers-by in the churchyard. Inside all the Christmas decorations are up ready for St James's School's nativity dress rehearsal tomorrow and the real thing on Friday. Next week we also have carols at Bermondsey Tube at 6.15pm on Monday and outside St James's Church on Wednesday at 6.30pm. 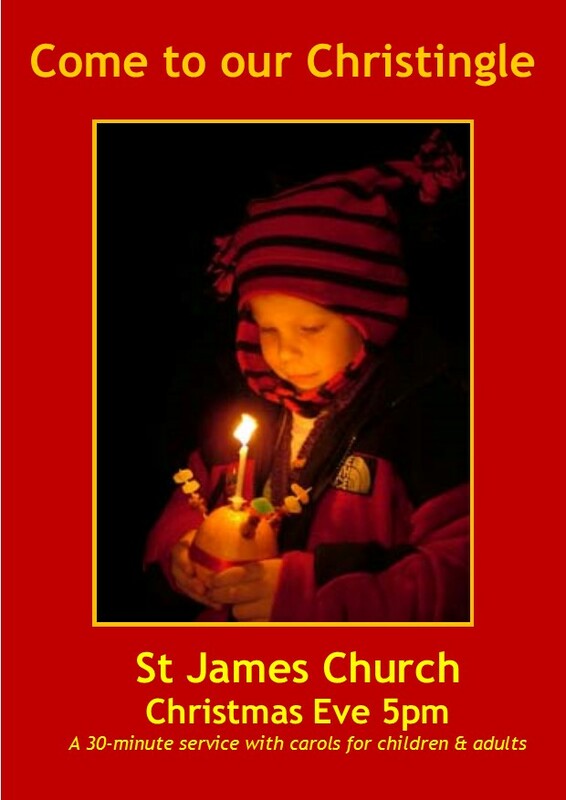 For full details of all Christmas events at St James click here and for St Anne's here. 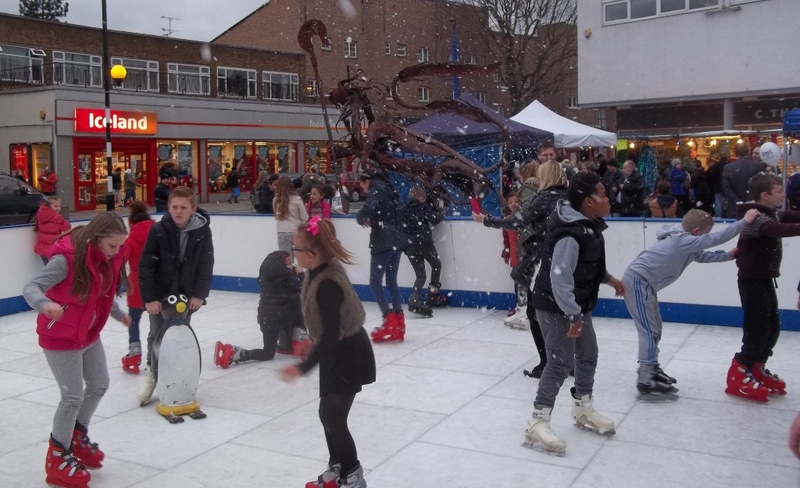 Christmas came early to the Blue this afternoon with a rodeo reindeer, a Christmas market, an escapologist, an artificial ice rink (left), Irish dancers, Santa's Grotto, Face-painting, carol singing and live music all adding to the festive fun. A great community event. Thank you to all the organisers. 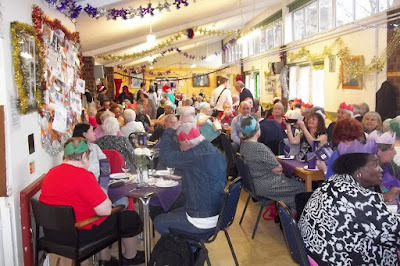 Meanwhile, at the Salmon Youth Centre, it was the annual Old People's Christmas Party. 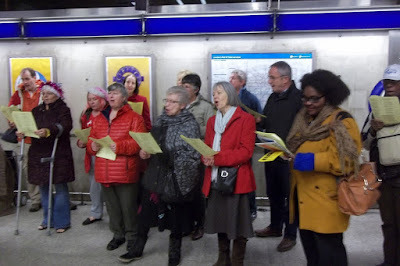 Londoner' and 'Any old Iron', a bit of Cliff Richard and Bing, carols (of course), some very talented musicians, a Christmas talk by Jos, the 'resis' singing the Bermondsey Waiters Song (Oh we are Bermondsey Waiters we are, We want to serve you like you was a star, Mince pies and rosie and plenty of cheer, Just because it is Christmas at this time of year), some brilliant salsa dancing by some very energetic youngsters (above), .....and Johnny's jokes, straight out of the Christmas cracker. Oh, yes, and don't forget Father Christmas, presents for everyone, all that food, and a lift home for everyone afterwards. Superb. Thank you Salmon. 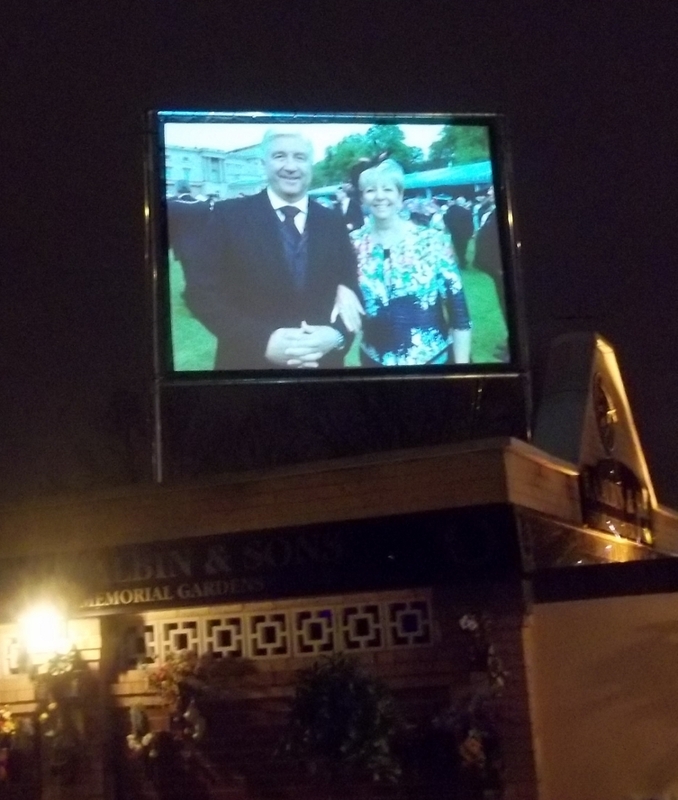 To Albins Memorial Garden on the edge of Southwark Park for their annual memorial service. The weather was kind to us for this year's open air service which annually draws nearly a thousand local people. Once again loved ones were remembered, carols were sung, prayers were offered, hot soup and mince pies were served and the traditional firework finale lit up the Rotherhithe sky, but there was something missing this year, or, rather there was someone missing, and he was on everyone's mind. 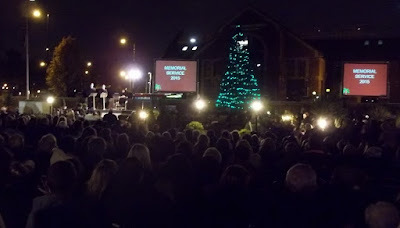 The open air Christmas memorial service was Barry's brainchild. 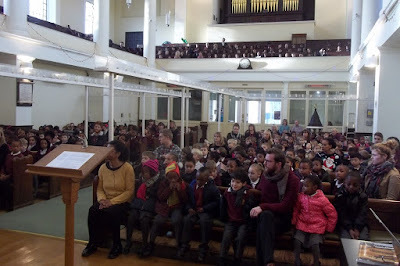 Most years he led and narrated it, and the whole event was an outflow of Barry's generous hearted compassion. And this was the first Memorial Service without Barry, but Jon and Simon and the whole Albins team marvellously kept the tradition going, and led us in moving concluding tribute to Barry himself, which included a wonderful photo montage (right) of the life that will be long remembered in Bermondsey.